The Slow Carving Of The Crazy Horse Monument A colossal monument of the Lakota warrior chief in South Dakota is 64 years in the making. Problems in the underlying rock are forcing the sculptors to deviate from the original model. But the family carving the monument says it will carry on even if it takes another lifetime to finish. The Crazy Horse monument in March 2012. When finished, it is expected to be 641 feet long and 563 feet high. It is the largest mountain carving in progress. South Dakota is famously home to Mount Rushmore, but it's also been making room for a second colossal mountain carving that, when finished, will dwarf the four presidents. 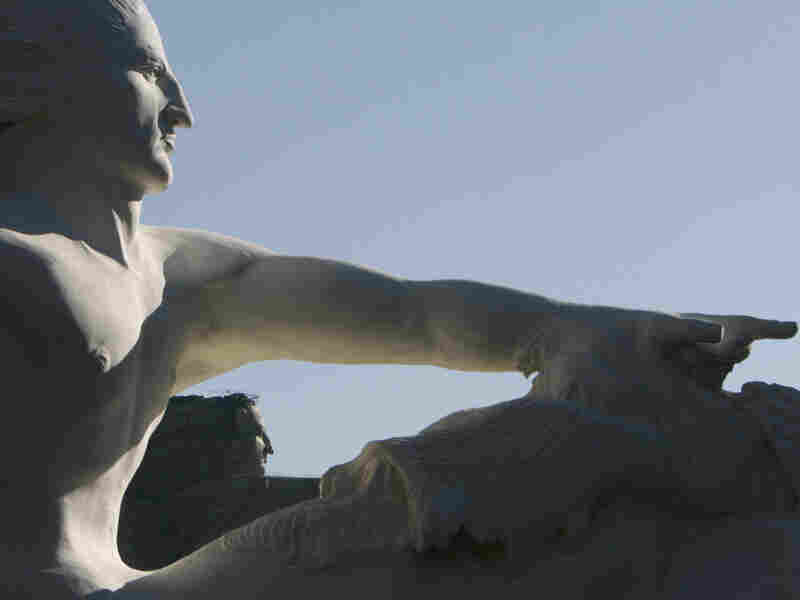 The sculpture in progress is of the Lakota warrior Chief Crazy Horse astride a stallion with his arm and pointed hand stretched out over the horse's mane. It's taking awhile. The Crazy Horse Memorial — taller than the Washington Monument and well over two football fields wide — has been 64 years in the making. And problems in the underlying rock are now forcing the sculptors to deviate from the original model. Sculptor Korczak Ziolkowski began the project 1948. "He believed you can do anything in this world. Nothing is impossible as long as you're willing to work hard enough and pay the price," says the sculptor's wife, Ruth, who is now 86 years old. 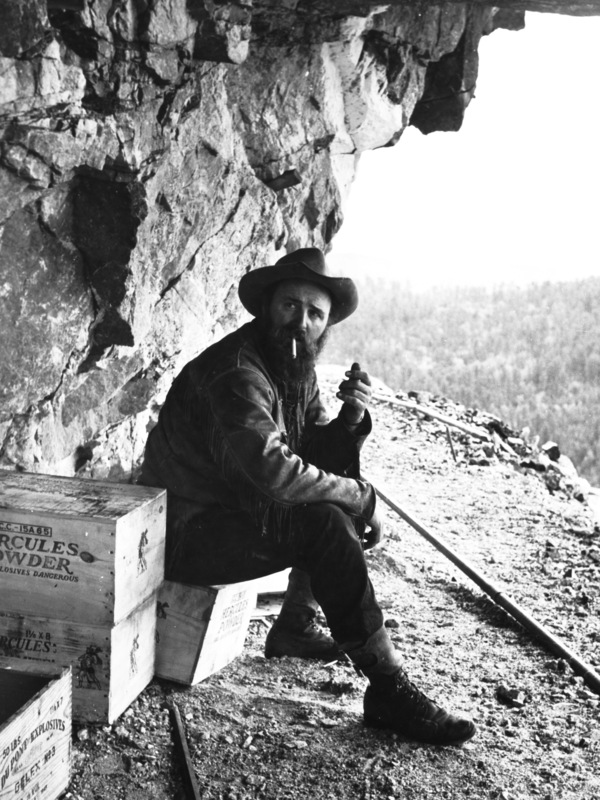 Sculptor Korczak Ziolkowski, who started the Crazy Horse memorial in 1948, smokes a cigarette near a crate of dynamite on a bluff of the Black Hills in 1950. Her long white hair is tied back, and despite her age, she still oversees all aspects of work on the monument. She and seven of her children took up the project after her husband's death in 1982. 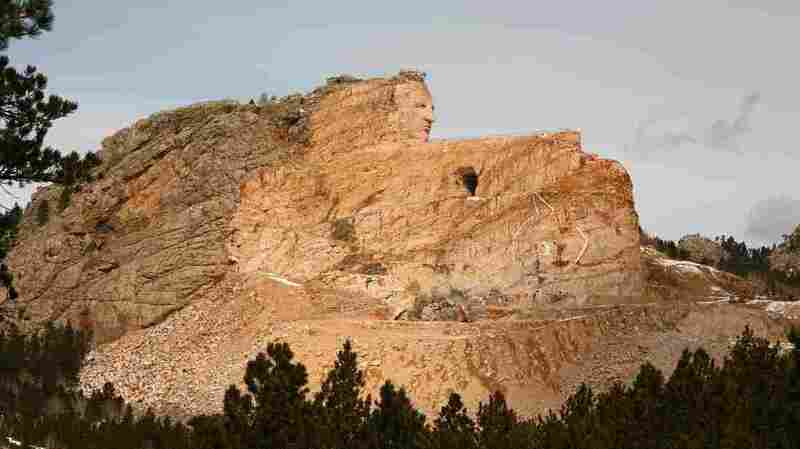 By the late 1990s, the face of Crazy Horse had emerged from the mountain carving. The last decade has been spent roughing out the horse's head — it's 22 stories high. Today, mountain carving is high-tech. An engineer uses a laser measuring device to plot in a 3-D point on the side of the granite face. Rock is then removed — not using a hammer and chisel but with explosives. For years the family followed their late father's model exactly. But Monique Ziolkowski, the sculptor's daughter, says the seams and cracks in the rock pose new challenges. "He always said you had to work with Mother Nature because she'll beat you every time. So that's why we're working with the engineers, and we will be putting bolts in for support, but the bulk of the mountain needs to stand on its own," she says. The changes include more rock left in place to support the outstretched arm and the horse's head. Teams of engineers and geologists carefully monitor each blast and help plot the way forward. All this is paid for through private funding managed by a nonprofit organization. The project uses no tax dollars. Some critics have questioned the snail's pace of the progress. Matriarch Ruth Ziolkowski answers them by quoting her late husband. A 1/34th scale model of what the Crazy Horse sculpture will look like, foreground, frames the actual carving in 2006. "He said, 'Go slowly so you do it right.' And, I, for one, would like to have it go faster, but there are so many things that you have to do in order to do it right that it takes the time," she says. This ambitious project has other critics, including some Native Americans who believe the humble Chief Crazy Horse would have never wanted his image carved into a sacred mountain. But supporters are quick to cite positive aspects of the memorial outside the carving, including the first classes held at a new on-site university, an expansive museum and a Native American college scholarship program targeting Native high school kids. On the main observation deck below the huge sculpture, a high school basketball team horses around. The team is from the Rosebud Reservation, and Coach Davis Reddest, a Lakota, brought his players here on a side trip from a nearby tournament. Reddest looks up at the giant carving, where construction excavators are removing recently blasted rock fragments. "It's good. I just don't know if it's going to be completed in my lifetime," says Reddest. "It's going to be awhile. It's a lot of rock." But others visiting this monument, including Bridget Martin from Wisconsin, are impressed with the progress. Martin remembers coming here as a kid back before the sculpture took shape. "You kind of look forward to it for your kids to come back in 10 years or 20 years and see it finished," she says. But the sculptors in the Black Hills won't estimate when the carving will be complete. It is now more than six decades in the making. In comparison, most historians say Egypt's Great Pyramid took about 20 years to finish.